Day 1 Fly to Whitehorse On arrival collect your car and proceed to your hotel. Day 2 Whitehorse/Haine’s Junction: Head west through the small villages of the territory to Haine’s Junction, situated on the edge of the massive Kluane National Park (95 miles). Day 3 Haine’s Junction/Beaver Creek: Continue west, stopping just short of the international border. After checking in to your hotel, depart on a flightseeing tour of Kluane National Park from high above (180 miles). Day 4 Beaver Creek/Fairbanks: Crossing into the United States, travel the Alaska Highway en route to Fairbanks, driving through Tok, Delta Junction and Eielson (310 miles). Day 5 Fairbanks/Denali National Park: Travel along the George Parks Highway, across the Tanana River and on to Denali National Park. Driving south, you will soon see Mount McKinley, an eternal sentinel that marks the entrance into Denali (164 miles). Day 6 Denali National Park: At leisure to explore some of the many day hike trails. Day 7 Denali National Park/Anchorage: Continue south, watching as the dense evergreen forests and windswept mountains give way to the lush Matanuska River Valley. Before dusk, you will reach Alaskas’s largest city, Anchorage (236 miles). Day 8 Anchorage: At leisure to experience the city and surrounds. Perhaps explore Chugach National Forest, or perhaps stroll through the Anchorage Botanical Gardens. 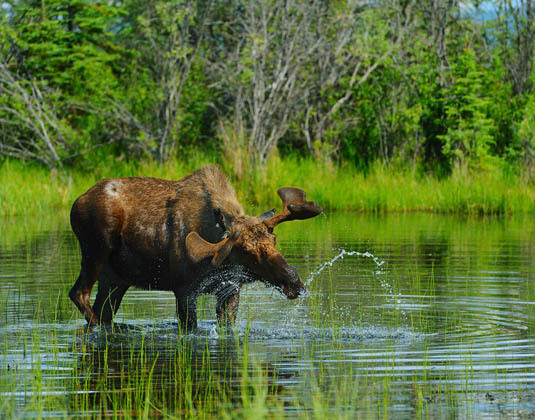 Day 9 Anchorage/Tok: Travel east along the highways just above the fjords and inlets that help create some of the most dramatic park settings in the north. Stop at Matanuska Glacier State Recreation Area and follow the trail that parallels the glacier. Continue to Tok (323 miles). Day 10 Tok/Dawson City: Striking back towards the border, pass back over into Canada at Little Gold Camp, the highest border crossing between the two countries. Follow the aptly named Top-of-the-World Highway to the riverside town of Dawson City (186 miles). Day 11 Dawson City: Relive the days of prospecting with a day of independent exploration of this historic city. Perhaps visit the surrounding goldfields, or for something slightly different, visit Diamond Tooth Gertie’s Gambling Hall! Day 12 Dawson City/Whitehorse: Drive along the Klondike Highway watching the Stewart River before it joins with the Yukon River, then pass through traditional hunting grounds of the Kaska Indians. Maybe stop at a gold rush staging post and Bonanza Creek before reaching Whitehorse where you’ll find an abundance of eateries (332 miles). Day 13 Whitehorse: A full day scenic coach trip along the South Klondike Highway to Fraser, British Columbia. Upon arrival board the world famous narrow gauge White Pass & Yukon Route Railway to journey through areas that still echo with the hardships and fortunes of the past. The route travels over the White Pass Summit, before ending in Skagway, Alaska. Return by coach to Whitehorse (397 miles). Day 14 Whitehorse: Return your car at the airport where your tour concludes. Departures: Daily between mid-May-mid Aug 18. Tour price: The price shown is based on the best value travel dates in low season and includes return international flight from London to Whitehorse, 14 days compact 2 door car with fully inclusive insurance, 13 nights accommodation, one hour flightseeing tour on day 3, full day White Pass & Yukon Route trip on day 13 and personalised roadbook.